Providing communities with market alternatives to investor-owned utility energy. power back in the community’s hands. What is Community Choice Energy? electricity load and purchases and/or generate electricity for their residents and businesses within their borders. provide meter reading, billing, maintenance, customer service, and outage response services. 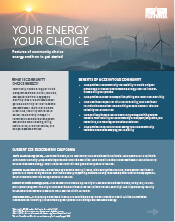 Learn more about what community choice energy is, how it works, and how it can benefit your organization and community. Download the white paper today! We are Pilot Power Group – a team of electricity market experts delivering custom energy solutions, portfolio management, energy procurement strategies, and renewable and CRR market products for community, commercial, and industrial customers participating in deregulated energy markets.